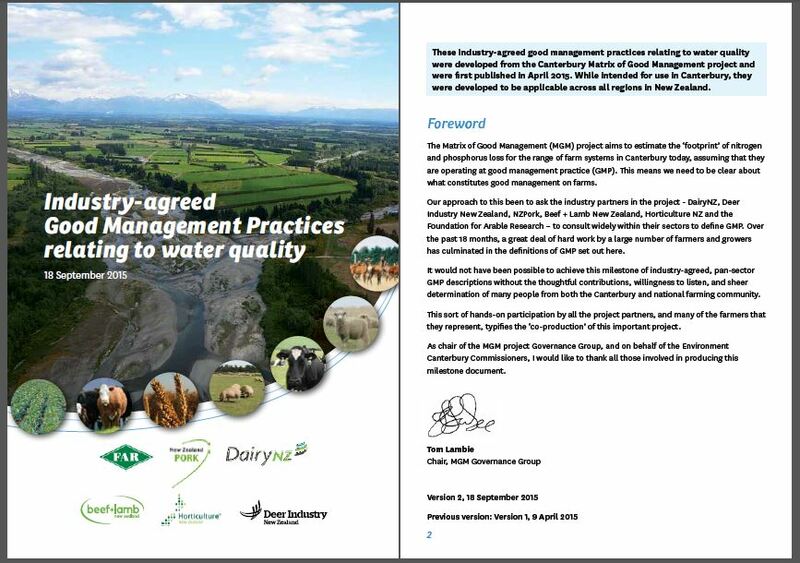 Good Management Practice (GMP) addresses the New Zealand-wide challenge of intensifying land uses and deteriorating water quality. ECan’s approach to this has been to ask the industry partners in the project – DairyNZ, Deer Industry New Zealand, NZPork, Beef + Lamb New Zealand, Horticulture NZ and the Foundation for Arable Research – to consult widely within their sectors to define GMP. Over 18 months, a great deal of hard work by a large number of farmers and growers has culminated in the definitions of GMP set out in the guide shown below. The guide provides describes 21 practices which improve irrigation, nutrient and animal management for all common land uses in Canterbury. The Matrix of Good Management project aims to estimate the “footprint” of nitrogen and phosphorus loss for the range of farm systems in Canterbury today, assuming that they are operating at good management practice (GMP). This means we need to be clear about what constitutes good management on farms. Listed below are a series of pdf’s taken from the ECan website containing useful links and information to various online resources around good management practices for farmers in Canterbury. Effluent Management – This pdf contains resources about effluent management, ranging from irrigation systems, storage, system operation, system design and setup, scheduling and operation, and risk management. General – This pdf contains general resources about good management practices for farmers, ranging from water management, nutrient loss, infrastructure, environmental risk management, sheep and beef farming, deer farming, infrastructure design and setup. Irrigation Management – This pdf contains resources about irrigation management, ranging from system design and set up, system performance, scheduling and operation. Nutrient Management – These pdfs contains resources about nutrient management, ranging from nitrogen & phosphorous management, precious agriculture, measuring nutrient losses, and nutrient management plans. Riparian Management – This pdf contains resources about riparian and wetland management, ranging from design and set up, planting and stock exclusion. Soil Management – This pdf contains resources about soil management, ranging from pasture management, soil quality, erosion and sediment management. Stock Management – This pdf contains resources about stock management. Winter feed checklist – This pdf contains a good practice checklist for winter grazing management.